We did honestly believe breakfast started at seven. Wrong. It starts at eight, at which time Katja’s first yoga class starts. We go beck up to the room and Katja makes oatmeal with banana. I pre-order my breakfast so it’s ready when I come down at eight. I’ll just eat and ride. Katja goes off to yoga, I blog and wait for breakfast. A quick breakfast later and I’m on the bike towards Sulahan village. I go wrong a turn or two, but managed to find the village. Finding the place of the competition is harder, but with a few words of English between them, a group of people are pointing me in the right direction. A big hall with lots of cars and bikes tell a tale of many people. I park the bike and go inside. I’m here. I find Bagus inside and go over and greet him. He’s nice as always and gives me a seat next to him. He explains the outline of the rules. It’s not so different from karate that I used to referee myself. Points for kicking, punches, takedowns and a combination of defence and offence. It’s also a rotation system for the referees where they use five on chairs around the fighting area and one to control the match. The Mat. Not easy to see, but there’s a circle on the mat that defines the legal area. Step outside the circle and you get punished. The first match are girls in a light weight class. Nothing much to write about as they use more time on preparing than actual fighting. Then the hall exploded as the first two boys set out to fight. Three rounds of spinning round kicks, flying takedowns and punching like maniacs. A close and tough match with a four-one win for Bakti Negara. There’s only two schools in this district. It used to be three schools, but one is no more. 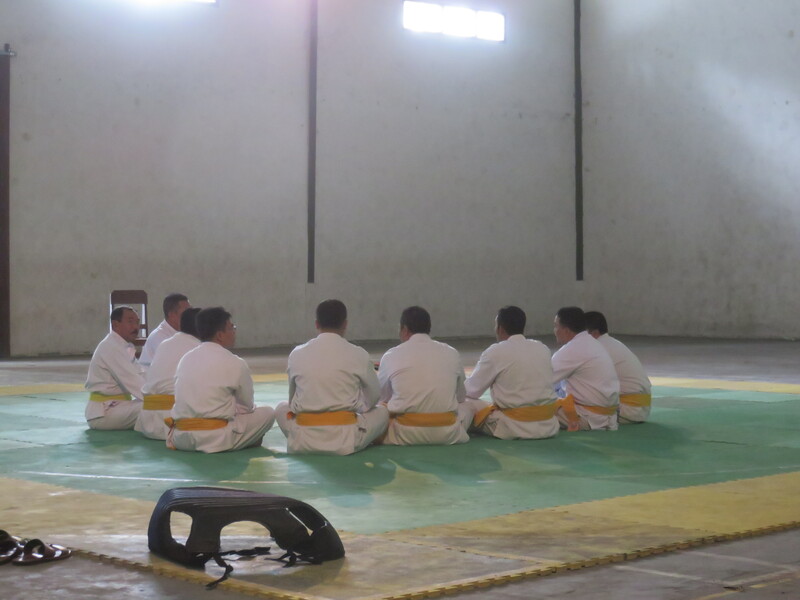 The two schools have good energy towards each other on the mat, but they cheer to support their own members wholeheartedly. Bagus is refereeing the first match and is off for the next two. He comes over to me with a cake from the referees table. Yummy. We watch the next matches together while I learn more of the rules. There are strict rules for grabbing and pulling. That will take away any points otherwise earned. It’s a total of ten matches, if I’m correct. Probably one match post weight class with the best from each school. I don’t know how many victories Bakti Negara took, but at least fifty percent. I say goodbye to Bagus, we agree on communication reading future training and I get back on the bike. In the arena I have been the only white guy with the attention that attracts. There are several, both young and old, that wanted to chat a little. One girl from the other school acted as interpreter for a while, and it’s all very nice. 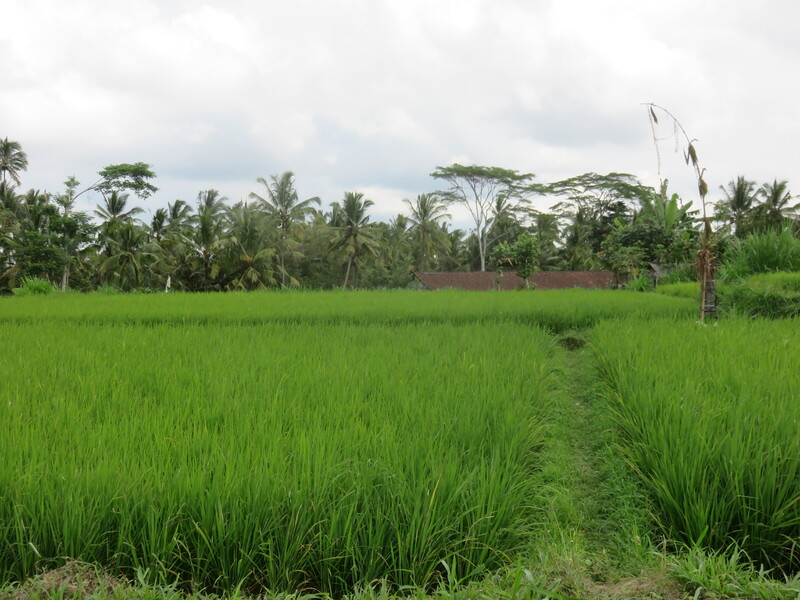 Balinese people are genuinely nice people with a warm and embracing attitude. On the bike I just follow the stream of motorbikes heading out from here. I figure they’re going towards civilization somewhere. They don’t. One after the other turn off the road a we head towards lower ground. Suddenly I am the only one still driving and I check Google maps. I’m way off the shortest or fastest route, but it’s manageable to get back on track. I stop and check the GPS at almost every turn and only go wrong once. Suddenly I recognize where I am and it’s pretty straight forward from there. I eat lunch at the Rendang place and communicate with Katja. She’s at a salad bar at the center of town. I finish my meal, pop into a helmet store and buy a new actually fitting helmet before heading to up to pick up Katja. It’s lots of traffic as usual but wet manage to get back to the hotel. We spend a little time in the room before heading out to a supermarket, Bintang, we’ve been told about. Turns out it’s much larger than the one we use, and a little cheaper on some products. It’s a bit of a drive, but nothing we can’t handle. We get a little plastic box so Katja can make porridge in the evening and store it for the next morning. She start her course at eight from next week and that’s when breakfast is first served at the hotel. Then we drive a little further up the road to Elephant restaurant and have dinner. It’s a vegetarian place and the food is probably the best vegetarian we’ve had on the tour. It’s absolutely delicious. Another of Jenny’s tip, of course. Then it’s back down to the hotel that’s an easier ride since traffic seems to die with daylight. As soon as it gets dark it’s almost no cars around. The new helmet got a visor that’s clear and it’s very nice to pull it down and enjoy it. In the room Katja needs to finish the books that’s mandatory reading for the course while I weigh on the blog. I get to Skype with my mom who’s birthday it is today. Happy birthday, mama. Another day in paradise Bali has come to an end. How I love this island! 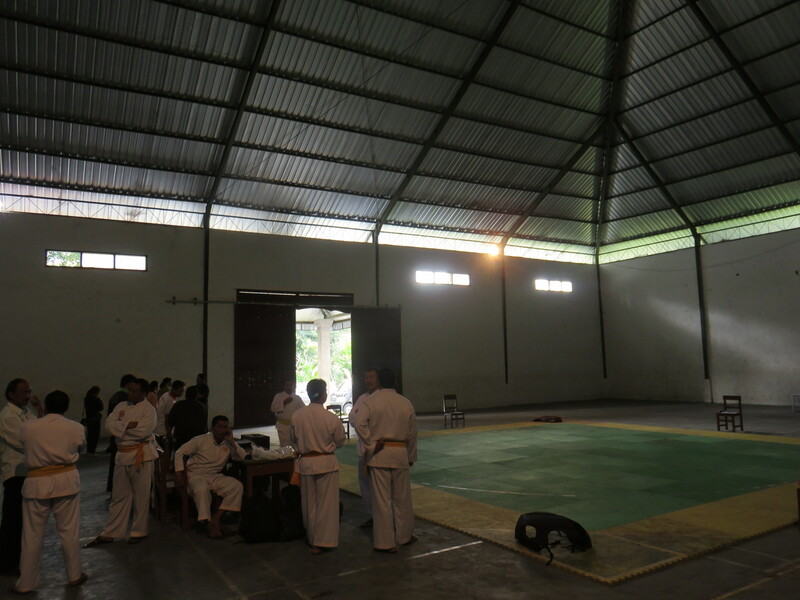 Categories: Indonesia | Tags: Bakti Negara, Bali, Martial Arts, Motorbike, Ubud, Yoga | Permalink.